It was inevitable that Walter Smith would be asked about investment in his beloved but under-performing Rangers yesterday as he conducted promotional duties at the refurbished Torrance Park Golf Club. The revamped clubhouse in question is part of a “mixed use development” of housing in the area under the auspices of Murray Estates. The company is run out of the offices of David Murray, who was along to unveil a plaque, in his first media-attended appearance among football personalities since his 2011 sale of Rangers pre-empted the club’s liquidation. There is little prospect of the post-liquidation Rangers any time soon operating at the level the Ibrox club did when money was no object for Murray. 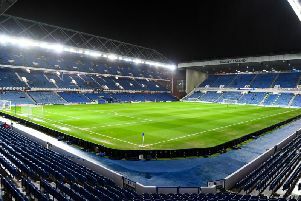 At Rangers’ agm next week, the current board will seek approval from shareholders to make it easier to sell stakes in the club to raise the additional funds considered crucial to making them more competitive in the SPFL’s top flight. Smith, who sat on the Ibrox board for a brief period during Charles Green era that followed liquidation, was asked his opinion of that move. His response was admirable for its candour. “I’m a football manager – my foray into being a director was a shambles! So I couldn’t tell anyone how to run the club in a financial sense,” Smith said. non-existent for Scottish clubs, in essence a circle needs to be squared for Rangers to again be a true on-field rival for Celtic. “That’s the difficult thing with the club overall and the circumstances they are in and trying to get out of,” he said. “That’s always going to be a problem. “There’s no doubt that the team needs investment but the previous circumstances that the new board have taken over mean it might take a bit of time to recover. There were some among the Rangers fraternity who seemed to believe their demand for a Premiership title could be instantly satisfied once Mark Warburton had earned promotion courtesy of a comprehensive Championship success last summer. Smith, however, stood apart from that. “I think they’ll be disappointed with the number of draws that they’ve had, at home especially,” he said. “If they had won more of those it would have lifted them up a bit and put them into second position. “But I thought there was always going to be a settling-in period and that it wouldn’t be as easy as a number of people had maybe thought. The strides forward have maybe not come as quickly as they would have hoped. “Celtic were always going to be strong favourites. “Everything about the club is solid. They’ve got a new manager in who so far has done a terrific job. “They’ve got a new look about them this season compared to last. So that was going to make it even more difficult for Rangers to come up and challenge them. “When you pick up on what you’ve got to improve on halfway through the season, in the second half you would want them to try to get closer to Celtic. But that looks like a difficult task. “The majority of fans are realistic as well. They take in the problems the club have,” added Smith. A source of angst is that one of the most vexing issues of this season has been self-inflicted. The narrative now runs that the signing of Joey Barton was always destined to bring trouble and strife and not much else – which is what came to pass after a training ground dispute with Warburton following only a handful of appearances led to the midfielder’s long-term suspension before he was paid off last week. Yet, as Smith points out, the 33-year-old Barton that arrived in the summer wasn’t the jailbird miscreant of old. “I don’t know Joey Barton at all. His reputation at Burnley wasn’t bad, was it? He was Championship Player of the Year. Unless I have missed something, I don’t think he did a great deal wrong.